the Christ, and I was no longer lost." little"; just what I wanted to do." as the greatest of dangers to be feared. of caring for them, they will be happy." 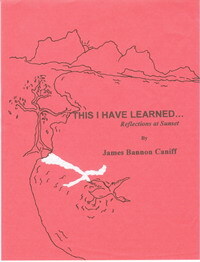 Reviews: "THIS I HAVE LEARNED"
conceived ideas that we all carry around. Archives. Look for "Ah, the Truth!" This book could not have been written by this author thirty or forty years ago. For the most part it could not have been written even ten years ago. For you see this book is the result of what his life and expericences in this world have taught him. Virtually none of it was learned easily, and most of it was learned under extremely trying circumstances. Most of it is essays on different subjects. There is one chapter, "False Premises," which contains an outline for study. Some of the chapters are biographical, which show, not just what the author learned, but what he had to experience to learn it. In the final analysis, however, it is a book of victory - victory over sin and all the wiles of Satan, and all by the grace of god. Jim Caniff, the grandson of Camp Meeting Bill and Sunday School Ellie, is an ordained minister who has written two previous books: The Synagogue of Satan, and An Indictment. He has pastored in Indiana and Kentucky and held revival meetings over a large segment of the country. In his youth he was an over-the-road truck driver. In business he has been a painting contractor, was an installer and repairman for large revolving tray ovens, and worked as a licensed private detective. He spent four years in the US Air Force where he was a control tower operator and spent a year in Korea and a year in Japan as such. 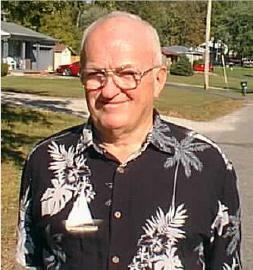 He received his formal education at Vincennes University, Edison College, and Asbury College. He is a widower and the father of two adult sons, David and Stephen. Jim resides in Salem, Indiana where his son, Stephen, is a pastor of a local church, and his son, David, works at a major wood-working facility. The price of the book will be $14.95 plus $3.99 S&H. It is a durable hardback construction. Payment by check, cash or money order. I am sorry but we are not presently equipped to accept debit or credit cards. It is available online from Amazon, Barnes & Noble, Alibris, and others or from your favorite book store. You can click on the cover of the book to order it through Amazon.